I wanted to start 2012 with a round of Insanity, but I wanted the weekends off, so this post is about what I’ve come up with. The original Insanity is a 9-week program. This is 10 weeks. My Insanity-with-weekends-off program includes all the high-work days that are part of Insanity, but, to compress the schedule while taking weekends off, I leave out all but the first and last fit tests, as well as some of the low-work days. Trust me, though, I’ll get plenty of work during this program, and so will you, if you choose to follow it. Here you do, day by day, with weekends off, if you start on a Monday. I am just starting Week 3. I see myself substituting some Ultimate Power Yoga routines during Week 5, the Recovery Week, but we’ll see how it goes. I love me some yoga and doing Core Cardio & Balance over and over (which is what the original Insanity calls for) is pretty boring. You may notice that the first month I put Cardio Recovery on Day 4 each week, instead of splitting the workouts in half by putting it at Day 3. That’s a personal preference, because I like to work hard, have a milder day (not that Cardio Recovery is that easy a workout, but it does take a day off from cardio), then another tough day, then 2 days off. If you want to put Cardio Recovery on Day 3, go for it. During the later weeks, I do go 2 cardio days, recovery day, 2 cardio days, because those later cardio days are tougher than the ones during the first months. Two weeks in, this seems pretty great. I am looking forward to finishing it up, because I am using this as a lead-in to my first time through Tony Horton’s P90X2. I’ve been on my fitness quest for about four years now. I went in with with an open mind, wanting to find out as much as I could, experiment on myself, see what works and what doesn’t. It’s more about what you eat than what you do. You can lose a lot of weight by eating properly. Without exercise, though, you will lose muscle along with the fat. You have to work out to build that muscle. Still, if your only goal is to lose weight, know that how you eat is responsible for about 80% of how your body looks. Carbs are not evil, but sugar is, and grains are not far behind. Fruits, vegetables, those are carbs. Eat ’em up. Anything with added sugar in it, though, is just asking for trouble. Then if you add grains, wow, you are really packing a caloric punch. By removing sweets from your diet, you can much more easily find your way to healthy eating habits. Not only that, but when you get used to eating less sugar, naturally sweet foods like fruits will taste sweeter to you. P90X is a great way to dive into a fitness-oriented lifestyle. It got me motivated, took me from a terrible diet to a pretty good one, and from walking/pushups/crunches to real, structured workouts. The main thing P90X did was show me that even people over-40 can get into shape. I’d just about given up, but now I am in the best shape of my adult life. Insanity is a great way to continue that fitness-oriented lifestyle. I lost some of the muscle I’d built with P90X when I went through Insanity, but did I really need all that muscle? The only part I regret is that I lost a lot of pullup (back) strength, so when I am doing a round of Insanity, I add pullups. Insanity doesn’t focus enough on the back muscles and I think the body needs that balance. I add yoga, too, just because I like starting the day with yoga. Insanity: The Asylum is just too much. Maybe I feel that way because I don’t have enough space to do all the moves conveniently, but…. You have to warm up first, no matter what it is you are going to do. Unless you are going for a walk, which is not really a workout, you gotta warm up. I have hurt myself doing impromptu pullups. True story. Insanity is good for my knees! I was shocked by this. Before I started P90X, my knees were okay, presenting minor problems when I tried to run, but they didn’t pain me much. A couple months into P90X, my left knee started bothering me. Not enough to make me stop, and the pain was not there when I exercised, but it was there from time to time. The pain was bothersome enough that I mentioned it to my doctor. He took a look and told me I had arthritis in that knee. I continued on with my P90X and One-On-One workouts. I didn’t start Insanity, because I figured if my knee was bad now, Insanity would put it over the top, right? So I put Insanity off for a few months. Then I took some time off to just do yoga and walking, give my body a rest, and my knee pain subsided considerably. When I went back to working out, it came back. At that point I said to myself, “If the pain can go away, then come back, that probably means it can go away again, so I’m going to go ahead and dive into Insanity.” After I started Insanity, my knee pain gradually diminished and has now disappeared. So … I stay away from Tony Horton (P90X) leg routines and stick with Shaun T (Insanity) ones. Yoga is one of the best things you can do for yourself. It is so all-around fitness-increasing, affecting breathing, balance, and strength. Your whole body is engaged in yoga moves. It inspires discipline. And, you know what? It ain’t for pussies. Yoga is hard. Don’t skip it. In fact, I added more. I much prefer body weight or band resistance training to working out with weights. Weight training is cool and I know it helps build strength and balance, but it’s a hassle. I guess that’s another reason to really like Insanity. I am not about building too much muscle, preferring a lean look, so it’s all good. If you can perform a fitness routine completely without breaks the first time through, it’s not a very useful fitness routine. You need something that challenges you. Any of the aerobic workouts in P90X and Insanity definitely qualify as useful, by that definition. Plus, here’s the thing, take, for example, the P90X Plyometrics routine. Man, that is a monster. I was stopping the DVD for extra breaks a lot when I first started it. Then not so much. Then, on the day I was able to get all the way through it without stopping, I had such a feeling of accomplishment. Rightly so! As for Insanity, I still have not got all the way through any of those routines. Close. But not quite. But I will. With that in mind, accept the fact that Insanity is (almost) impossible. I say “almost” because, I suppose, anything is possible. For Insanity, unlike for P90X, I say take breaks without pausing the DVD, but don’t dog it. Get back in as soon as possible. You can build great abs without doing any crunches. That is a fact, and Shaun T (Insanity) knows how to do that. Insanity is great for abs. I’m sure I’ve learned more than that, but those are a few good lessons that came to mind pretty quickly. I don’t know what happened. I so rarely get sick that it always surprises the hell out of me when it happens. I felt fine when I went to bed on Sunday, but I woke up around 4:00am on Monday and I was not well. I’ll skip the details. That little virus — I assume it was — put me out for Monday. I mean, I slept almost all day, joined the land of the living for six hours or so, then slept from 10:30 to 6:00 the next morning. I felt a lot better on Tuesday, but when I started my workout, I could barely make it through the warm-up. So I stopped, not wanting to push my body too far. It seems my trek through The Asylum has been aborted by a virus! Yeah, I have a big weekend of traveling and partying coming up, so I cannot pick back up when I’m back to 100% (which should be tomorrow). I guess I will have to try again in the future. You know what? That’s okay. Truth be told, I was really burnt out, anyway, and I think I know why. I tend to work out in a 3-weeks on / 1-week off pattern, with the off week consisting of some aerobics and yoga. Sometimes I stretch it to 4-weeks on, but not beyond that. I learned this routine in P90X, and it’s served me well. The off week always seems to come at the right time. When I started The Asylum, I did it on a whim, not thinking about my previous schedule. As I look back, I had already been on for two weeks, and that was when I started the hardest workout program I’d ever been through. Not smart, and it’s no wonder I broke down. In fact, that may have very well been why I was susceptible to that virus that hit me. Anyway, this experience will make me more mindful of proper rest in the future. As for The Asylum, I enjoyed pieces of it — “Strength” especially, and “Vertical Plyo” — quite a bit, but much of it I found just too cumbersome, with my needing to move the ladder, readjust my foam pad, too often. If only I had a bit more space, but I don’t. 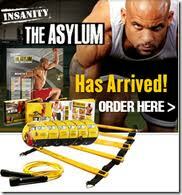 From a physical standpoint, wow, The Asylum really does reach beyond Insanity! There is so much full body stuff going on, and great back work, which was missing almost completely from Insanity. I would highly recommend The Asylum, if you are trying to push your body to extremes and want a program that will take a body that is already in great shape … and … make … it … even … better. Oh, wow, I demolished “Game Day” today. I will feel this tomorrow. I did not, however, demolish “Overtime”. I was so wiped out by the time I finished “Game Day”, that I pretty much just dogged it through the “Overtime” part. No matter. As I’ve said before, “Game Day” is a very difficult workout. It is an hour of non-stop aerobics, with deep moves that work the whole body. So I’m good with having killed that hour, even if it was at the expense of the extra moves. I need to stay within myself, while still giving everything I have. I accomplished that today. Day 24 of The Asylum, “Strength”. Last week I was not sure I would make it here. I upped my carbs to 20%, so I’m at 50% protein, 30% fat, and 20% carbs. I think my body likes that ratio. We’ll see. I know there are people who get by without many carbs at all. I have a friend who is one of those guys. But, you know what? He’s is a really low energy person. Extra-low. That’s not me. So, I’m at 20% carbs. Yesterday I was talking about how worn out I feel. Now we can see what the numbers say about that. Holy crap! The numbers are up quite a bit. There was no improvement for many of the moves, but the moves that did improve were up 13% to 25% to, in the chest section, 30% and 40% for the last two moves! This is very interesting to me, because I did not expect this kind of improvement, especially because, not needing to write down the move names this time, I was not pausing as often. Is it coincidental that my improvement came with increased carb consumption? Hmmm…. Needless to say this motivates me. My body is apparently not as worn out as I thought it was. Maybe that worn-out feeling was more a carb depletion phenomenon. I’m sure there are low-carb people who would say I just need to continue low-carb until my body gets used to burning fat instead of carbs for energy. Maybe they’re correct, but I just don’t have time to find out right now. Anyway, even with the extra carbs, I am taking yet another day off tomorrow, partly because I’m sure I could use it, but mostly because I have to do an on-location video shoot all day. That will put a huge strain on me, so I’ll wait for Sunday to do “Game Day” and “Overtime” for the last time.